I have a very busy week starting tomorrow, so this weekend I prepped a bunch of food ahead of time for the week, including a grass fed chuck roast from Triple L Ranch. After cooking I shredded the beef for sandwiches through the week. This was incredibly simple yet full of flavor. Be sure to spoon some of the leftover juice from the pan over top the shredded beef to keep it moist. 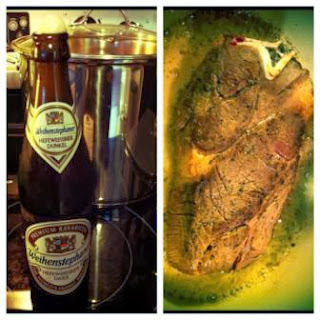 Rinse chuck roast and pat dry with paper towels. Season with kosher salt and cracked black pepper. Let sit at room temp 10-15 minutes. Heat about 2-3 tablespoons each of olive oil and butter in a Dutch oven on medium high heat. Brown all sides of the meat. While the roast is still in the pan, deglaze it with one pint (minus two or three sips) of beer, this Hefeweissbier is fantastic! But any beer of choice will work. We just prefer the taste of this one. Top the pot with a lid and transfer it to a 350 degree oven until meat is fork tender. This roast was 3.5 pounds so it took about 2.75 hours before it fell off the bone. Let the meat rest 10-15 minutes and then shred the it. Spoon drippings from the pot over the meat (I did not make a gravy as this meat will be used for sandwiches, hot and cold). Store in a tightly sealed glass container in the fridge until ready to use but no more than five days.